A General now statesman, Secretary of State George C. Marshall would give a speech only a few months later that would again change the world. On June 5, 1947, on the steps of Memorial Church at Harvard University, he outlined an ambitious European Recovery Program (ERP) that would soon carry his name, the Marshall Plan. He stated: "The modern system of the division of labor upon which the exchange of products is based is in danger of breaking down.... It is logical that the United States should do whatever it is able to do to assist in the return of normal economic health to the world, without which there can be no political stability and no assured peace. Our policy is not directed against any country, but against hunger, poverty, desperation and chaos." 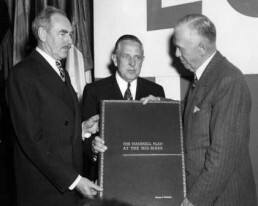 Although the plan was designed primarily by William L. Clayton and George F. Kennan, both members of the State Department, it was Marshall who presented the concept to the American people and Congress, in such a manner, as to avoid the mistakes that had been made in post-World War One Europe from re-occurring. It was the policy of American isolationism that had allowed the Treaty of Versailles to endanger Europe and brought forth a second bitter war to the continent. Marshall realized this mistake must not repeat itself. Sixteen nations met in Paris, outlining the assistance that each required and how this aid was to be divided. The final proposal agreed upon by delegates asked for $22 billion in aid; a figure that President Truman could not justify in Congress. Although Truman cut the request to $17 billion, the plan still met with strong opposition and after much filibustering, Congress approved $12.4 billion. President Truman officially signed the Marshall Plan into law on April 3, 1948. The Economic Cooperation Administration (ECA), headed by Paul G. Hoffman, was formed to administer the funds. The first aid had already been provided to Greece and Turkey in January 1947, prior to the official signing of the program. Italy followed in July 1948. The majority of the funds provided, went to purchase goods, mainly manufactured or produced in the United States. At the beginning, this was primarily food and fuel. Although this may also be considered the main criticism of the program; in that America was following a concept for economic imperialism, in an attempt to gain economic control of Europe. But in reality, the amounts that America donated as part of the Marshall Plan, can hardly be considered "imperialism", in that they represent only a small fraction of the GNP, and the duration of the program was limited from the start. Beginning in April 1948, the United States provided these funds for economic and technical assistance to those European countries that had joined the Organization for European Economic Co-operation. In Germany, a vast amount of money was invested in the rebuilding of industry, with the coal industry alone receiving 40% of these funds. The concept was simple enough, companies that were provided such funds, were obliged to repay these "loans" to their government, so that these same funds could be used to assist other businesses and industries. Post-war Germany had been forced to dismantle a great deal of its major factories and industries, according to guidelines enforced by the Allied Control Council. Figures for car production alone had been set to levels that represented only 10% of pre-war numbers. With the introduction by the Western Allies of the German "Mark" as the new official currency, on June 21, 1948, a new economic era was signalled within Europe and especially Germany. The Petersberg Agreement, signed in November 1949, increased these production figures for Germany dramatically. 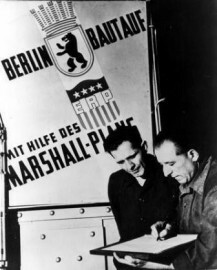 Therefore, Germany in particular was keen on maintaining this concept, even after the Marshall Plan had officially terminated, so that this process continues today. The KfW Bank (Kreditanstalt für Wiederaufbau) headquartered in Frankfurt, has since 1948, administrated these funds. Under the leadership of Dr. Hermann-Josef Abs and Dr. Otto Schniewind, the KfW Bank continued to work "miracles", during the "Wirtschaft Wunder" years, playing an important role in getting the German economy going. By 1950, 12% of their loans were used for housing construction. With the unification of Germany, the KfW helped pay, between 1990 and 1997, for the modernisation of 3.2 million apartments in the former East Germany, nearly one half of all existing housing structures in the new States. This institution has an annual revenue of 70 billion Euro. 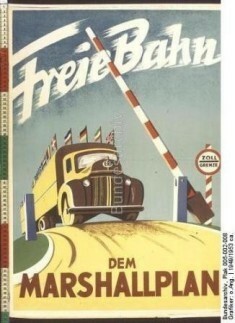 The KfW is Europe's largest promotional bank, promoting the legacy of the Marshall Plan in third world countries today, in much the same way, with a new primary emphasis on microfinance; the loaning of small amounts to impoverished third world individuals, to start a small business. The other European countries, over the years, have absorbed these "repaid" funds into their national budgets, thereby "disappearing". It was never intended that these funds were to be repaid to the American government. 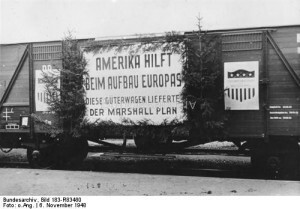 The Marshall Plan also included a Technical Assistance Program, which funded engineers and industrialists to visit the United States, to gain first-hand experience of industrial capitalism and technological transfer. Under the same program, American engineers came to Europe, to advise and provide technical support to developing industries. After four years, the program had surpassed all expectations, with each member country achieving a larger GNP (Gross National Product) than pre-war levels. On December 11, 1953, George Marshall was awarded the coveted Nobel Peace Prize, for his work. In his speech, he stated: "There has been considerable comment over the awarding of the Nobel Peace Prize to a soldier. I am afraid this does not seem as remarkable to me as it quite evidently appears to others. I know a great deal of the horrors and tragedies of war. Today, as chairman of the American Battle Monuments Commission, it is my duty to supervise the construction and maintenance of military cemeteries in many countries overseas, particularly in Western Europe. The cost of war in human lives is constantly spread before me, written neatly in many ledgers whose columns are gravestones. I am deeply moved to find some means or method of avoiding another calamity of war. Almost daily I hear from the wives, or mothers, or families of the fallen. The tragedy of the aftermath is almost constantly before me." Within the short period between 1948 and 1952, Europe experienced a dramatic increase in economic production. The hunger and starvation experienced by so many displaced persons, literally disappeared overnight. Whether or not, the Marshall Plan alone can be accredited for this achievement is a question that historians may never be fully able to answer. For sure, the Marshall Plan acted to expedite the developmental process. The Soviets and the Eastern Bloc naturally turned down any such aid offered by the Americans, thereby causing yet another wedge between the two political systems, which was followed by the introduction of an East German Mark in July 1948, the blockade of Berlin and the ensuing Berlin Airlift in 1948/49. For Finland, Hungary, Romania and especially East Germany; the Soviets demanded large reparation sums and goods, which in turn slowed down their economic development after the war dramatically. Without question, the Marshall Plan laid the foundation of European integration, easing trade between member nations, setting up the institutions that coordinated the economies of Europe into a single efficient unit. It served as a prelude to the creation of the United Europe that we have today. Only a few years after the Marshall Plan Program; Belgium, France, Italy, Luxembourg, the Netherlands and West Germany, joined together and formed the European Economic Community (EEC), with the signing of the Treaties of Rome, in 1957. A development within Europe that continued to expand it's membership, culminating in the Maastricht Treaty of November 1, 1993, forming the European Union, that resulted in the new European-wide currency, the "Euro", which replaced all national legal tender of member countries, in 2002. Former U.S. Vice President Al Gore has also suggested a "Global Marshall Plan", intended to allocate funds from wealthy nations, to assist in the development of environmentally based industries in Third World Countries. When one considers that 15 million children die of hunger each year; that 1 in 12 people on this earth are undernourished; or that 1 in 4 live on less than $1 per day; perhaps such a program would be money well spent. But this is a phenomena no longer restricted to developing countries when we see that 1 out of every 8 children in the United States under the age of 12, is hungry; or that 17 percent German children live near or under the poverty levels today. 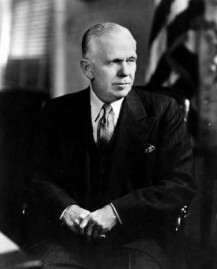 Although the ERP concept has proven itself, the world needs a statesman whose respect is worldwide and indubitable, as that of George Marshall.